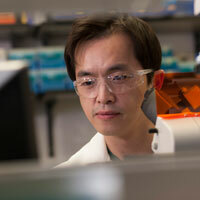 INDIANAPOLIS -- Chien-Chi Lin, an assistant professor in the Department of Biomedical Engineering at the School of Engineering and Technology at Indiana University-Purdue University Indianapolis, has been selected to receive a National Science Foundation Faculty Early Career Development Program Award. This award recognizes the highest level of excellence among early-stage researchers. NSF awarded the $490,000 grant for the project "CAREER: A reversible dynamic hydrogel system for studying stemness and drug responsiveness of cancer stem cells." "A CAREER award from NSF is an exceptional achievement for a young faculty member,” said Ed Berbari, chair of the Department of Biomedical Engineering. “It speaks to their accomplishments and promise in the future. Dr. Lin is an ideal candidate for this award, and his contributions to our department and our students will benefit our campus in many ways and well into the future." According to the CAREER program, this is among NSF’s most prestigious awards that support junior faculty “who exemplify the role of teacher-scholars through outstanding research, excellent education and the integration of education and research within the context of the mission of their organizations. Such activities should build a firm foundation for a lifetime of leadership in integrating education and research. This award will fund Lin’s interdisciplinary research project integrating knowledge and technology from polymer science and engineering, and peptide and macromolecular chemistry, as well as cellular and molecular biology related to cancer stem cells. Cancer stem cells are highly metastatic and resistant to drug treatment, and many believe that understanding the behaviors of these cells may one day lead to the discovery of effective treatments against highly metastatic tumors, such as pancreatic cancer. Lin’s research has focused on the development of highly tunable hydrogels for tissue regeneration and drug delivery applications. Hydrogels, a type of crosslinked polymer that imbibes large amount of water without dissolving, have been extensively used in biomedical applications. In addition to hydrogels and cancer stem cell research, Lin plans to integrate the research results from this award into his teaching in both undergraduate and graduate levels. He also plans to integrate his research into diverse educational outreach activities designed to promote the awareness of both biomaterials and cancer biology. These outreach activities will include participants from young and underrepresented groups at the campus level through the POWER and MEAP camps organized by the School of Engineering and Technology. Other outreach activities include free workshops with hands-on activities on hydrogel fabrication for high school educators as well as international students and researchers.